and yes that is my "1962 Ashley Sportiva Coupe Rego No. 6999 MU" in the picture. Last time I saw the car in 1979 it had been brush painted British Racing Green. 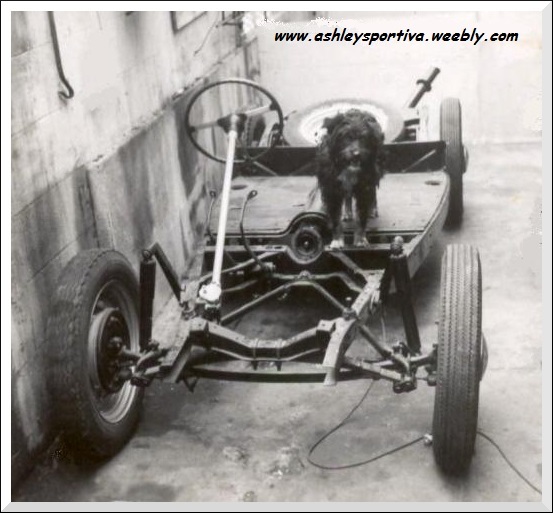 I built an Ashley Sportiva bodied special back in the 1960’s, I started out in 1960 (at the age of 15) with the help of my Dad Ernie (Ernest Coster) and mate Barry Marzetti by stripping a 1936 Ford 10 down to the chassis before realising that it was too old for what we wanted i.e., the chassis was a different design to that required for this Sportiva body, (sorry to all the Ford 10 fan’s out there). 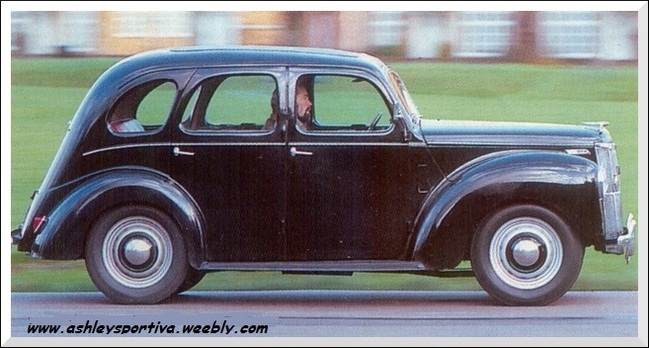 (a Magazine in the UK for selling and buying just about anything), this project was already stripped down and came with many new parts, and it was a 1948 Ford prefect (see photo). The chassis had been cleaned and the sides boxed in to strengthen it, so it was only a case of restoring all the mechanical parts and adding the body. New springs were fitted at front and rear plus new shock absorber units added to the front suspension, these were special parts available for specials at the time, (see photo). Chassis and my K9 helper & guard dog. The original differential was replaced with a high ratio crown wheel and pinion and the gearbox fitted with close ratio gears to suit the Ford box, all gearbox bearings etc, were replaced at the same time, We kept the standard size Ford road wheels but equipped them with chrome wheel trims and spinners, these were all the rage at the time. The engine, a standard Ford 1172cc E93A was re-bored 30thou. Oversize, new pistons and rings were fitted along with a new high lift profile cam shaft and double valve springs were added, the cylinder head was replaced with a high compression copper plated head. To all this we added a free flow inlet & exhaust manifold with twin 1.25 inch SU carburetors and a 2 inch copper exhaust system with a straight through silencer, (that didn’t silence very much and made sure that everyone could hear me coming). We also had to fit an export water pump because the new radiator required for the low bonnet line was lower than the cylinder head, which meant that you couldn’t get natural hot water flow. The electrical system was 12 volts (earlier cars were sometimes 6 volt), we also fitted a complete new wiring loom as well as an SU fuel pump, electric windscreen wipers and electric radiator cooling fan. The interior, a 2 + 2 layout we fitted with tilt forward bucket seats, the rear seat my mate Barry Marzetti's mother made using the same vinyl so as to match the front seats, the door panels and side panels I made myself again from the same matching vinyl. Combined water temperature & oil pressure gauges. We fitted a 3 spoke wood rimed steering wheel and a remote gear changer, the original upright gear change was too far forward (under the dashboard) and would have been just about level with the roof line. The colour scheme was red body outside with a grey, white & black mottled finish on the roof inside, (this was the standard Ashley body finish), to match this I had grey upholstery with red beading on the seating and side panels with dark red & black mottled carpet with a black vinyl dashboard. The finished car was originally registered in 1962 at Edmonton, London. ( the first “A” rego came out a few months later). The finished car was quite fast with very good acceleration, it’s top speed I clocked at 100 mph but it was becoming a bit unstable and bounced around a bit so had to lift off the gas as a roundabout was approaching rather fast, (it was the Robin Hood roundabout on the New Epping Road, Ashley Laminates original home). Through the gears it would hit 30 mph in 1st, 70mph in 2nd and 100 mph in 3rd (top gear), not that I drove it like that all the time but sometimes you just have to try it out and of course it was before overall speed limits. I used the car daily to travel to work for three years until I sold it just before leaving to emigrate to Australia back in 1965. 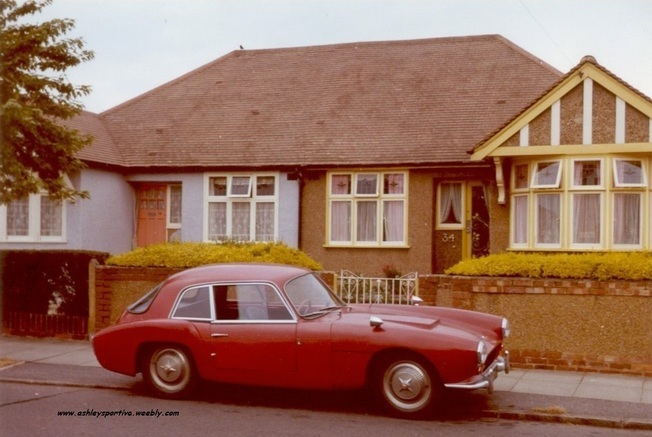 I returned in 1968 and again in 1979 to visit mum & dad and saw the car on both occasions; in 1968 it looked much the same as when sold, however in 1979 it was looking very tatty and had been repainted dark green, each sighting was in the Tottenham/Edmonton/Enfield area of London. Ashley Laminates Limited was the name of the company that manufactured the Ashley Sportiva fibreglass body shell; it was the last of the full body shell kits produced by the company. 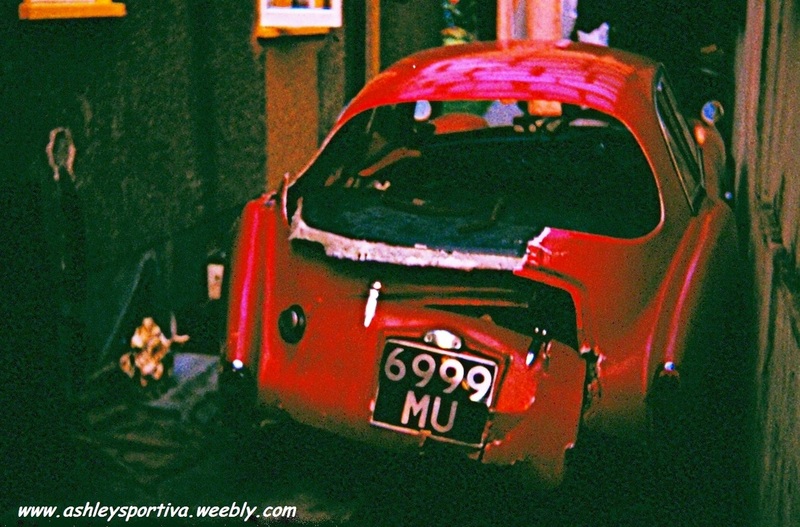 The body shell kit was complete with tilt forward bonnet and grille, doors, all glass windows and lift up boot lid. It was supplied with all locks and hinges and front over-riders attached to the moulded fibreglass bumper on the bonnet also front and rear lights and turn indicators (the 3 segment rear lights were as used on the Hillman Minx of that era). The resin finish of the body shell was excellent and didn’t need painting and the inside the cabin was sprayed with a grey, white & black mottled finish to the roof area and the dashboard was black, the body shell was well made with all edges properly finished and steel mounting brackets for mounting to chassis bonded into the body. I believe that the price I payed in 1960 was ₤182.00, which was to me a lot of cash at the time considering that an electrical engineers wage was ₤20.00 a week and mine was only ₤5.00. My dad and I first became aware of Ashley laminates when passing through Loughton on one of our visits to Clacton, my dad had some years earlier built a caravan and he had it on a site in Clacton, where we had many a holiday. 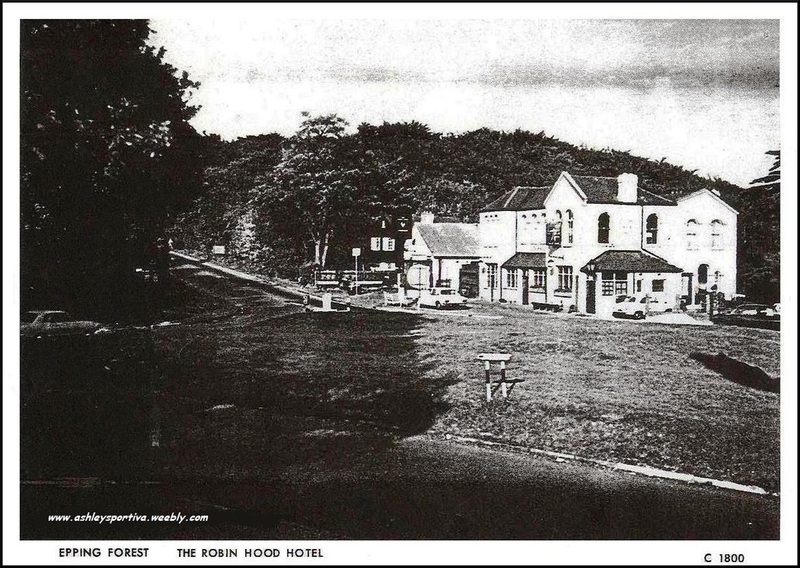 We spotted the body shells outside the small factory (more like a large garage than a factory) alongside the Robin Hood Pub (see photo) and had stopped to have a look, this would have been around 1958/59. I guess I took a liking to the shape and styling of the 1172 body shell and decided to build a car using it, however by the time I got to the stage of buying it the Sportiva have arrived on the scene and I decided on it instead. Ashley Laminates had also by then moved, first to the Potteries, in Upshire and then to Bush Fair, in Harlow, which is where I went when I eventually purchased my body shell. I remember the showroom had a couple of different body shells and also the Ashley MkVI chassis (see photo) which included a fibreglass floor pan and rear seat wells, it also included front and rear suspension and clutch & brake pedal pendant assembly, very nice but too expensive for me at that time. There was also a range of products suitable for specials and a number of hardtops & bonnets for Austin Healey Sprites and other production sports cars. LIVING WITH AN ASHLEY SPORTIVA. During the three years that I had the Ashley it was used as my daily transport, except for a period of about 6 months when it was laid up at a smash repair yard, getting a fibreglass car body repaired was not very easy in those days. It didn't help that the person that hit me in the rear (see photo) didn't have insurance and was also a petty criminal so was very uncooperative anyway. My insurance wasn't much better but did eventually pay up and the repairs were made, they made a very good job of it too and it looked as good as new, inside the boot you could see that there had been a repair made but it was only really a spare wheel and toolbox compartment. Interestingly enough this compartment was lockable but one morning on the way to work I must have sprung the lock, after going over a pot hole or bump maybe, and I lost the spare wheel and toolbox. I discovered this on arrival at work and retraced the trip back to home but some kind sole must have thought it was his birthday and made off with it, I reported it to the local police but it was never handed in. Other than these two occasions the rest of the time was most enjoyable and I had many good times with my car, the car was a bit unusual and I only ever recall seeing one other Sportiva on the road, it was a good car, the ride was a bit hard and if carrying 4 then the 2 people in the rear seat needed to be short (or headless). I remember one Novembers day at work a Smog came down in the afternoon, I worked at Southgate then and if anyone knows the area Southgate is on higher ground than Palmers Green and Edmonton, anyway after leaving work we drove down into Palmers Green and the Smog was so thick we could not see the end of the bonnet, my two mates that were with me, (Barry Marzetti and Roger Wardley), had to walk ahead, one level with the front of the car calling out directions and the other alongside the passenger window relaying them to me. If we had known how thick it was going to be we would have left it in the office carpark and all walked home, but it was only misty in Southgate.Anybody that remembers the old London Smogs of the 1950-60's will know how thick they could be,I kid you not I could not see the front of my car when sitting in the drivers seat, that would be about two metres distance max. I then met the love of my life, who was due to go to Australia, a few months later I followed her to Australia where we married and have lived ever since. My car, well I sold her for ₤500.00 before I left. Our stake in a new life in the the colonies. (Last time I saw the car was in 1979 in Enfield, London and it was painted British Racing Green).